Would you like to wander the streets of a charming fishermen village? Maybe to explore the lush vegetation of Polynesia? To discover the beautiful buildings of China or the ruins of Colonial Mexico? Would you like to feel like a real cowboy or to live a magical adventure with your family among the characters of Sesame Street? We make your dreams come true, all this is possible and even it can be done on the same day. Six worlds filled with surprises await you in PortAventura Park. In each you will find shops to buy an original souvenir. You'll enjoy incredible shows, full of colour, imagination, music, dancing ... and of course the best attractions. Fun, refreshing, striking, impressive or quiet, for all ages and tastes, these attractions will guarantee you fun all day long; you will only want to get down from it to savour the delicious dishes in our restaurants. In addition, by the privileged location of the park, situated in one of the best tourist areas of Spain, in Catalonia, near Barcelona, in the heart of the Costa Dorada, you will enjoy a wide variety of tourist activities, sports and relaxation after visiting us. Opening hours you can find here. 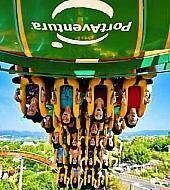 PortAventura is located between the coastal towns of Vila-seca and Salou, in the province of Tarragona, about 100km from Barcelona. So distance is not a problem whether you want to get away for a day trip at PortAventura or enjoy a short break at the best theme park in Europe. Travelling by plane? Buses run regularly from Barcelona airport to PortAventura. If you prefer, you can take the train to the city centre and from there take another to the park, or alternatively take a taxi or rent a car from the airport terminal. If you are visiting Barcelona on a cruise, you can reach PortAventura by bus, train, taxi or by renting a car. For train travel, the company Renfe offers various options for both middle distance (Commuter) and High Speed(AVE, Euromed) so you can enjoy all our attractions in no time at all. And if you choose to visit by car, you just need to know the simple route with direct access from motorway AP-7.